Fix problem peripherals by finding and loading kernel modules. This article is excerpted from chapter 15 of Linux in Action, published by Manning. Linux manages hardware peripherals using kernel modules. Here's how that works. A running Linux kernel is one of those things you don't want to upset. After all, the kernel is the software that drives everything your computer does. Considering how many details have to be simultaneously managed on a live system, it's better to leave the kernel to do its job with as few distractions as possible. But if it's impossible to make even small changes to the compute environment without rebooting the whole system, then plugging in a new webcam or printer could cause a painful disruption to your workflow. Having to reboot each time you add a device to get the system to recognize it is hardly efficient. To create an effective balance between the opposing virtues of stability and usability, Linux isolates the kernel, but lets you add specific functionality on the fly through loadable kernel modules (LKMs). As shown in the figure below, you can think of a module as a piece of software that tells the kernel where to find a device and what to do with it. In turn, the kernel makes the device available to users and processes and oversees its operation. 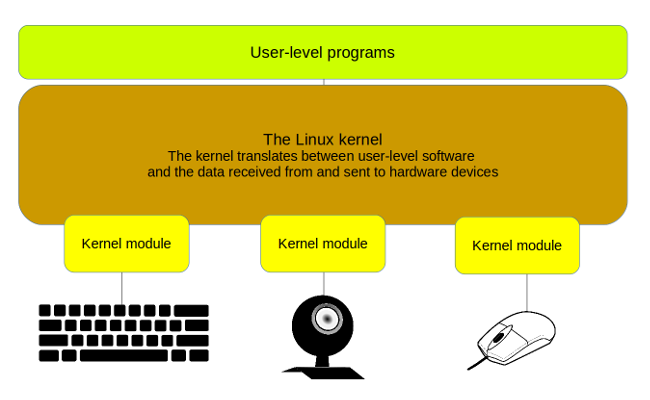 Kernel modules act as translators between devices and the Linux kernel. There's nothing stopping you from writing your own module to support a device exactly the way you'd like it, but why bother? The Linux module library is already so robust that there's usually no need to roll your own. And the vast majority of the time, Linux will automatically load a new device's module without you even knowing it. Still, there are times when, for some reason, it doesn't happen by itself. (You don't want to leave that hiring manager impatiently waiting for your smiling face to join the video conference job interview for too long.) To help things along, you'll want to understand a bit more about kernel modules and, in particular, how to find the actual module that will run your peripheral and then how to manually activate it. In my case, the active kernel is the version with the highest release number (4.4.0-104-generic), but there's no guarantee that that'll be the same for you (kernels are frequently updated). If you're going to be doing some work with modules that you'd like to use on a live system, you need to be sure you've got the right directory tree. You'll find most of the modules organized within their subdirectories beneath the kernel/ directory. Take a few minutes to browse through those directories to get an idea of how things are arranged and what's available. The filenames usually give you a good idea of what you're looking at. There are 33,350 available modules!?! It looks like someone's been working hard over the years to provide us with the software to run our physical devices. Note: On some systems, you might encounter customized modules that are referenced either with their unique entries in the /etc/modules file or as a configuration file saved to /etc/modules-load.d/. The odds are that such modules are the product of local development projects, perhaps involving cutting-edge experiments. Either way, it's good to have some idea of what it is you're looking at. That's how you find modules. Your next job is to figure out how to manually load an inactive module if, for some reason, it didn't happen on its own. Before you can load a kernel module, logic dictates that you'll have to confirm it exists. And before you can do that, you'll need to know what it's called. Getting that part sometimes requires equal parts magic and luck and some help from of the hard work of online documentation authors. Linux recognized the interface (the Atheros AR9485) but listed it as unclaimed. Well, as they say, "When the going gets tough, the tough search the internet." I ran a search for atheros ar9 linux module and, after sifting through pages and pages of five- and even 10-year-old results advising me to either write my own module or just give up, I finally discovered that (with Ubuntu 16.04, at least) a working module existed. Its name is ath9k. That's it. No reboots. No fuss. Again: no reboots. No stubborn blood stains.